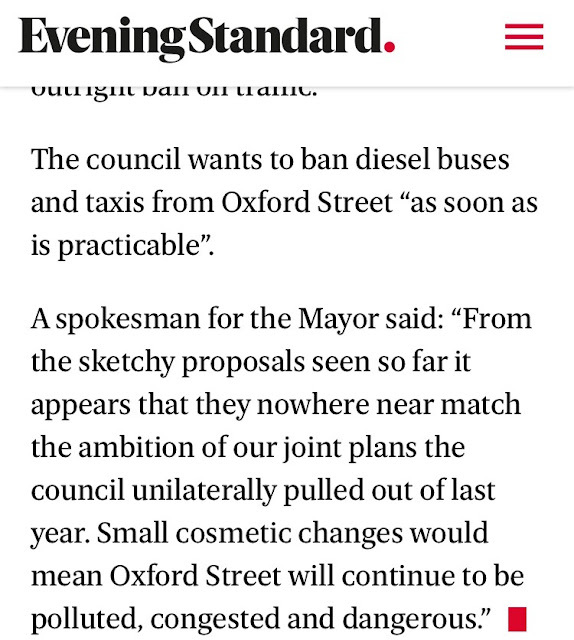 Westminster Announce They Want To Ban Diesel Taxis From Oxford Street As Soon As Practical! 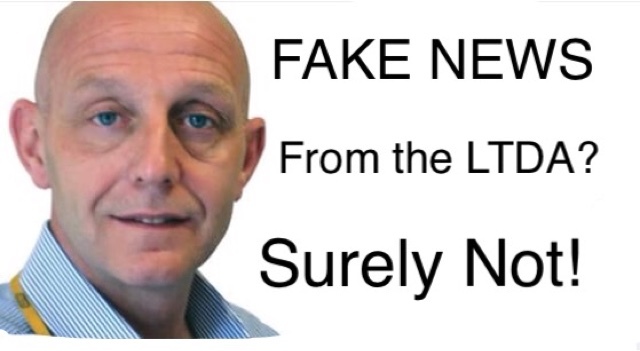 In a vitriotic email to his members, the General Secretary of the LTDA inferred that a statement posted on the Taxi Leaks news blog (assumed as no one else put out the story) was ‘Fake News’. The story in question from last week stated that in a meeting with Westminster Council, the Trade was informed Taxis could to be banned from parts of Oxford Street and that an announcement would be made this week. As the trade suffers the effects of all these roads closures and alterations, many drivers are stunned by the LTDA’s waiting and seeing policy and total resistance to challenge these latest proposals. 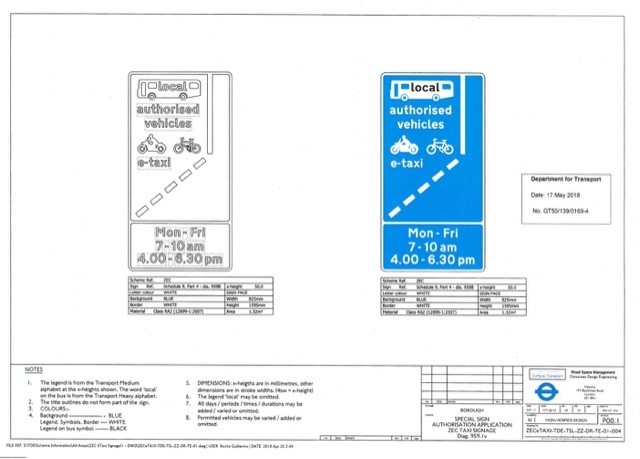 Surely there’s no conflict of interest involved here, with the proposed eTaxi only bus lanes ? Even with the hundreds of marshals, A Bus has just knocked down a pedestrian in the new two way Baker Street, Northbound Should it now be taxis and cycles only? Just three months ago, very few had heard of United Trade Action Group ("UTAG"). In that short time period, UTAG has made our intentions patently clear that we shall fight to defend our trade from those that wish to seek us harm. We have gained tremendous support from both sides of our fragmented industry, this illustrates the broad injustice and frustration felt by all. To date, we have been overwhelmed by the support, both vocal but most importantly financial, for without, we could not pursue the course of legal actions we identified to protect our illustrious industry. 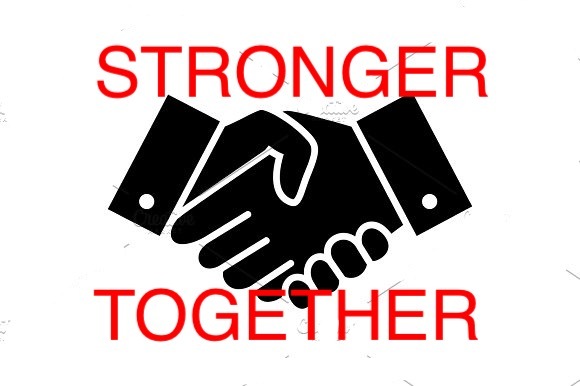 The desire to work professionally and collaboratively is evident from the volumes of donators and we intend to continue with this unified path, ignoring the neigh sayers. At UTAG we started a movement, a movement based on the will of the people, a movement that has put our detractors on notice that the London taxi trade, the best taxi service in the world, is not going to sit idly by and allow others to dismantle us one piece at a time. We have shown that when we stand shoulder-to-shoulder, we can be a formidable force. The ongoing ITA protests are an indication of the resolve this industry has. Our Judicial Review was a fight that the trade wanted to have based on a series of circumstances that appeared to link the Judge of Uber's licensing appeal, to Uber. Winning, although morale boosting, was never going to be a 'game changer' for the trade and the same applied to a loss. UTAG's arguments on behalf of the trade, were found to be meritorious by Mr Justice Walker, and we took on a formidable challenge, by challenging the Judiciary, demonstrating to all, our very deliberate intentions to fight wherever and whomever necessary to retain our jobs. Regrettably that initial challenge has proved to be insurmountable and we have learned that our submissions on bias have failed, as has our arguments regarding the granting of a probationary license. However, the failure to win the JR does not mean that UTAG fails, we shall fight on. To attain your badges, each one of you have already proved that you are fighters, you didn't give up at the first set back and neither shall UTAG. You fought to gain your badges and we must continue the fight to defend them. Friends, we have lost the opening battle but the war for our survival very much rages on. UTAG took on the responsibility of the JR on behalf of the trade, to fight a necessary battle, however, a win was never going to be our panacea. To date, your financial support has been outstanding and we need for you to keep faith in UTAG for the massive battles ahead. With your assistance, we can still determine our own future. Whilst it has been strategically necessary to date to avoid answering questions relating to funding, we wish to share with you that UTAG has more financial contributors than UCG, LCDC, Unite and RMT have in combined memberships. The trades' support of UTAG has been overwhelming, however, we need more, we need for everyone to get behind UTAG and provide us with the financial resources to see us to the next stage of action, action against our regulator. The battles ahead will be challenging but those battles shall define our future and whether we actually have one. We have the ability to determine our own future, let's not allow that opportunity to pass us by. 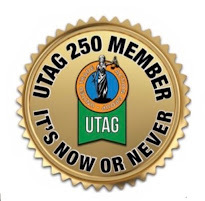 Please continue your support of UTAG or now join in the fight. Now or Never. After the news that new euro6 Diesel engines are currently being manufactured that are producing zero Nox....Grant Davis pleads with the GLA and TfL to allow us to buy these Euro6 diesels, the ones authorised by TfL for use by Addison Lee and other private hire companies. With just one choice of taxi available, we will die, quite simple. We need a choice of vehicle. This week I have been emailing the GLA and TFL over the urgent need for the trade to be able to purchase Euro6 diesel taxis. They will be able to have 15yr life span and the air will get cleaner as we take older taxis off the fleet by natural wastage and thus no need for a 12 year age limit. We cannot sit back and watch our trade be decimated by fools any longer. The promise made to the Mayor by the LTDA that we will have 9k on the road is now being used to bash us with, not good. It’s getting serious now, as more job losses at LEVC we’re announced yesterday at a fleet/garage meeting at BREWERY ROAD. I pray we do not go back to the sad situation of being left with NO PARTS supply, NO WARRANTY and NOTHING TO BUY. What’s urgently needed is a temporary stop gap, such as being allowed to purchase The EURO 6 VITO diesel... until other workable alternatives are available and the infrastructure has been enhanced. Running on petrol all day was never the original plan. If addlee are allowed to buy euro 6 cars, why are we not allowed to buy euro 6 vito, or tx4? Yep Grant of the LCDC is all over this like a rash, we all should support this ORG as is the only group who see this as total bias towards PH. 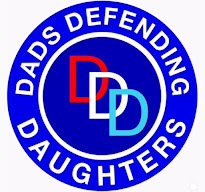 Plus we should all support and sign up to UTAG, as this is an association of drivers from all orgs and businesses who are fighting TFL on everything and you can help for as little as a fiver a week. The latest trade associated business to donate to UTAG is Sophisticats, who recently moved from Marylebone Lane to Eversholt Street. We’ve been informed that they have made a substantial donation. Euro 6 Vito has a 15 year life, as has the Electric Taxi from LEVC, but you can guarantee the Mercedes will be alive and kicking in 15 years time and spares always available. We need to now fight to reinstate the euro 6 diesel VITO... If private hire are allowed to run clean euro 6 diesels, then so should we ! A ORANGE DIARY holder customer walks in today and I go into the UTAG sales pitch . The driver did not have a clue on the JR, HIGH COURT, UTAG , DEMO’s , 4% Uber discount for TfL staff on TfL’s staff website, THE BADGE PAPER....after a few minutes with myself, result...he is now FULLY IN !! It’s mind blowing how many out there, really haven’t got a clue ... I have spoke to many, but on the plus side there are many who are well informed. It is up to the drivers who know what’s going on, to try and spread the word of UTAG and the fight against the injustice against our trade. Khan Said “Should I Ignore the Evidence From Experts.... But Will He Ignore This Evidence ??? SOME new diesel cars emit almost no NOX emissions despite common belief being that they are dirty and harmful. Shock new research claims that some of the latest diesel cars emit almost no NOx, despite their condemnation. Diesel cars have been in decline since the VW dieselgate scandal which shocked the industry back in 2015. It was found that the carmaker had used defeat devices on cars to trick emissions tests to make cars appear cleaner than they actually were. 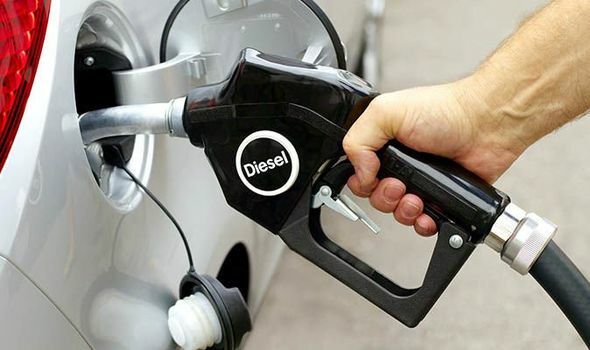 Last year the percentage of diesel cars registered in 2018 was over 20 per cent lower than the previous year and this is set to continue. A common perception among drivers in the UK is that diesel cars are dirty and you should not buy one anymore. New independent testing has, however, suggested that new diesel cars are actually incredibly clean, despite common belief. German automobile club (ADAC) conducted on-road RDE (real driving emissions) on a number of petrol and diesel cars to see how clean they were. Certain Mercedes, Vauxhall, and BMW cars emit almost no nitrogen oxides, significantly less than the legal limit. Under the Euro 6d Temp emissions rules cars must produce less than 168mg/km of NOx. During the tests, the Mercedes C-Class C220d actually emitted no NOx at all during the test while the BMW 5 Series 520d Touring emitted just 1mg per kilometre. Similarly, a 1.6-litre diesel Opel (Vauxhall) Astra also emitted just 1mg/km of nitrogen oxides. The BMW 520d Steptronic also emitted just 5mg/km, Citroen Berlingo BlueHDI 130 emitted just 7mg/km and the VW Golf 1.6 TDI SCR emit just 14mg/km. Of the 13 cars tested, the vehicle that produced the most NOx was the Honda Civic 1.6 i-DTEC which emitted 101mg/km, which is still significantly less than the 168mg/km limit. This news will come as reassurance to car manufacturers who have previously tried to defend diesel cars as the new engines are significantly cleaner than those that have come before. Carmakers have been facing challenges to get cars to meet new real-weld driving emissions limits across the world. RDE NOx limits are set at 80mg/km (milligrams per kilometre) for diesel cars, and 60mg/km for petrols vehicles to be compliant under the new worldwide harmonized light vehicles test procedure (WLTP) tests. However, to allow carmakers time to make their cars meet these new standards there is conformity facto of 2.1, which means cars can emit 2.1 times the limit of NOx. This will be reduced from January 2020 to 1.5 times at 120mg/km of NOx. Protests, Parasites, JRs and Uber Discounts To TfL Staff. Yesterday saw the end of week five, in the series of ITA protests aimed at central London local councils and TfL. The slogan of the protests "WHERE BUSES GO, TAXIS GO. In the last fortnight, we’ve seen something totally amazing, something our detractors said could never be achieved and that being The UTAG JR against the Uber verdict, heard at the Royal Courts of Justice. On top of that, we’ve had the scandalous revelations from the UCG's Trevor Merrills and Angie Clarkson that Uber’s defence Council Hogan Lovell, has referred to the Taxi Trade as parasitic...this was followed by the news that Uber, have an account to advertise their services at discounted rates to TfL staff on the Staff’s own website. 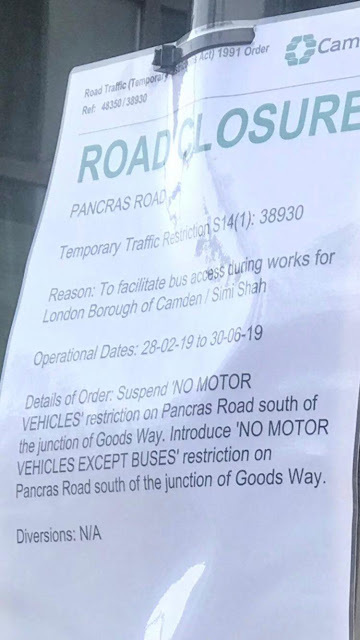 Also this week more chaos from Camden as they intend to divert all south bound buses from Midland Road to join the gridlock of the badly phased lights in Pancras Road. Slight panic at first as the sign on the corner of Goodsway said "No motor vehicles except buses".... but this was soon changed after a quick phone call from the LCDC. It’s now transpired that Hogan Lovells (Uber’s law firm) have referred to the London Taxi Trade as parasitic. Quietly and constantly the trade has been going about its charitable work for over seven decades. Post from Mandy Baylis on Save Black Taxis Facebook Page. 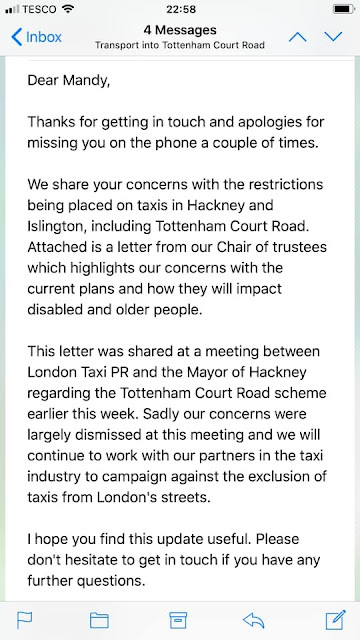 Having emailed Scope, RNIB and Transport For All to highlight the issues facing their members/the people they represent, regarding the Mayor’s plans for Tottenham Court Road I received this reply today from Transport For All. Great work, as always, from the guys at London Taxi PR, and even though Transport for alls’ concerns were largely dismissed, thought it may be nice to know they fully support you. TAXIS SHOW TALENT...A Cabbie Gala Night ... Interview with Frances Wyhowska. An afternoon of infinite variety. 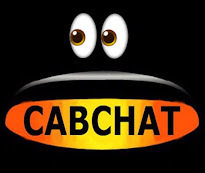 Let the cab trade entertain you with comedy and song. Important announcement from the ITA : Parliament Square Protests. The Met Police have asked that Millbank alongside the House of Lords be kept clear. As they have been very accommodating with the protests so far, we feel this request should be facilitated. When making your way to the protests please use Victoria Street/Broad Sanctuary , Birdcage Walk/Great George , Whitehall and Bridge Street. Don’t forget this is a fight we must win so please answer the call, and support your trade. The Taxi Trade protests in Parliament Square are legitimate, peaceful protests that are receiving a lot of attention from both Houses, especially Lords. In the shadow of the Brexit mismanagement, SadiqKhan is pushing through his crazy traffic schemes in tangent with the extortionate ‘Poll Tax On Wheels’, without the raising of one eyebrow from our national media. 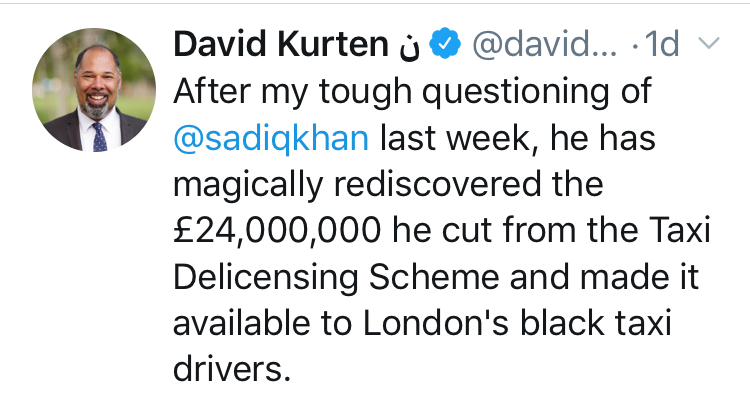 Not only that but local councils are using Sadiq Khan’s lies on pollution to creat utter carnage on London’s major arteries, resulting in gridlock. The business world is now calling for the embankment to be unblocked after TfL’s commissioner Mike Brown apologised for rushing out the segregated cycle lanes without proper planning. We have video clips of ambulances and paramedic (first response) vehicles, unable to move, stuck in the chaos of Midland Road, where the Lycra clad councillors from Camden thought it would be a great idea to close off a through route at major cross road and condense four lanes of traffic into just one, to install a extra wide cycle lane. Midland road is used heavily, to ferry away passengers (by Taxi, Bus, Coach, Car) from one of the busiest international termini in Europe. Not one word from the mainstream media about the gridlock, and it’s not going to stop any time soon, as more ridiculous schemes have already been and will later be announced. The Taxi Trade is using the only tool left in our armoury, as our largest org again says we should do nothing and wait and see (a policy that has already lost the trade access to the Bank Junction). Drivers have gathered to protested peacefully over the last few weeks on Tottenham Court Road and Parliament Square. The protests are planned to continue, in spite of the threat from a minicab Union to meet us head on in the Square on Monday the 25th (when Westminster is expected to announce all traffic other than Buses and Cycles to be banned from parts of Oxford Street). In a did to contact organisers, the Met police have tweeted asking for a meeting, but we’ve been there before! 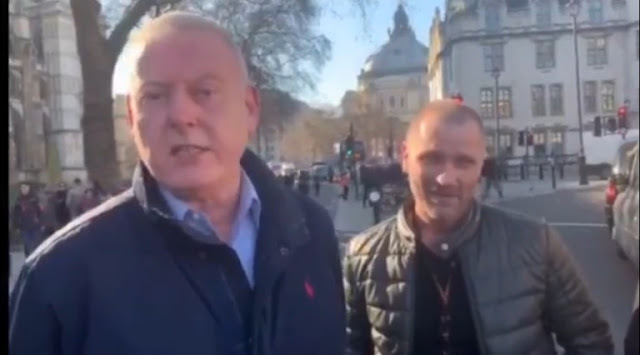 The ITA are sceptical about meeting the police who when they met with the UCG, served up the leaders with section 12s and 14s, making it almost impossible for them to organise a decent demo again. It’s vital that ever Taxi turns up on Monday as we can’t let minicabs hijack our protests. We need to completely seal off the surrounding area with cabs! It’s not we don’t sympathise with their protest because if they are forced to pay the congestion charge, they become a very valuable commodity, worth about £30m per year to TfL. But there’s no way they are not hijacking our protest. Monday is a must for every driver who values his trade. If these protests diminish and die, the trade will never managed to put together another protest and we will just fade away mirroring the demise of the red telephone box. London Taxi PR (LTPR), an organisation which represents the interests of the Licensed London Taxi profession, has announced that it has held an exploratory talks meeting with both the Mayor of Hackney and representatives from Hackney Council to discuss the ULEV road restrictions that have been imposed in the Borough. 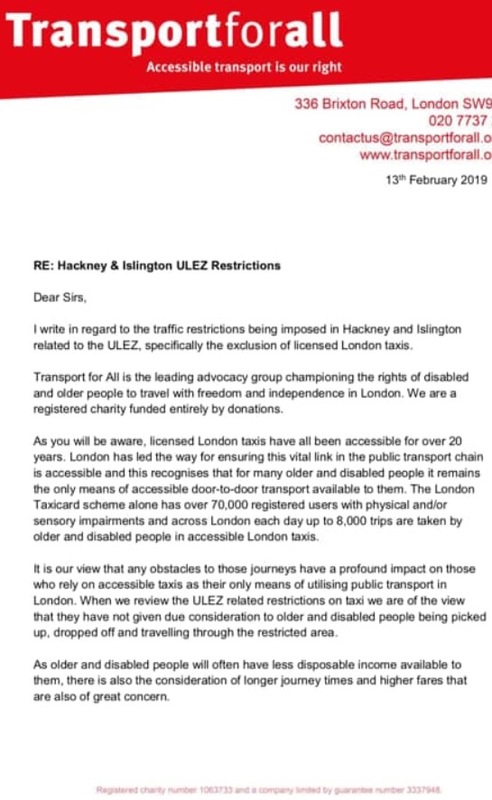 The talks were held at Hackney Town Hall on 18thFebruary 2019 and have been instigated due to LTPR’s persistent campaigning not only on behalf of the licensed Taxi profession, but on behalf of ALL Taxi passengers, particularly those with disabilities who rely on London Taxis as part of the public transportation system, to retain their independence for transport purposes. 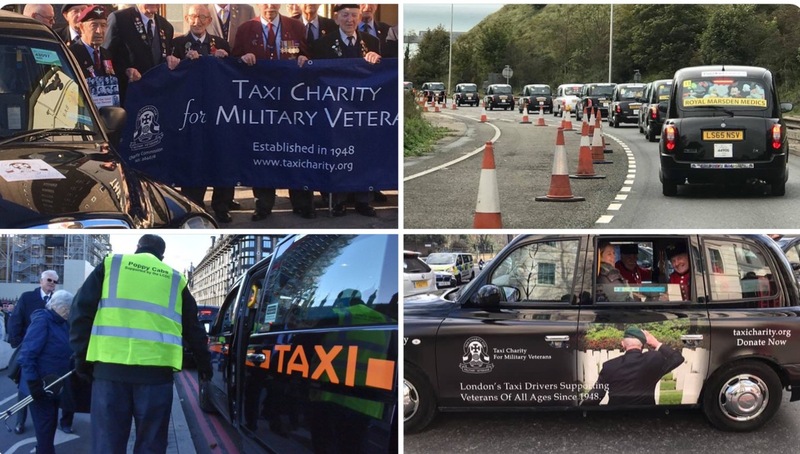 As a result of consultation with various organisations, LTPR has gained the support for their campaign to have these restrictions lifted for ALL London Taxis from organisations such as Transport for All, an advocacy group who champion the rights of Disabled and older people to travel with independence in London. The London Taxicard scheme alone has over 70,000 registered users with physical and/or sensory impairments and across London each day up to 8,000 trips are taken by older and disabled people in accessible London taxis. Inclusion London, which supports over 70 deaf and disabled organisations working across every London borough have also offered their support for LTPR’s campaign. Both of their supporting statements with regards to the implications of restrictions of movement and their freedom of choice that is being applied to passengers who may be elderly or have disabilities, were just one of the main concerns that were highlighted by LTPR during the meeting with the Mayor of Hackney. 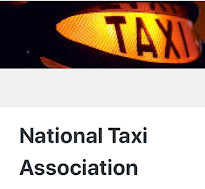 they have in the opinion of the licensed London Taxi profession, completely restricted access to these routes for London Taxis, and also taken away the ability for customers to choose Taxis to travel to and from these areas. What is more, these restrictions could be seen as effectively as a restraint of trade being applied to the London Taxi profession, by restricting their ability to move around freely, thereby forcing them into the same traffic as all other motorists. London Taxis have been able to move without restriction throughout London for 365 years, providing the only public transport door to door service for passengers. By restricting access to roads in the Boroughs of London such as Hackney, they are effectively being forced into only being able to offer a 5% service to customers, due to only 5% of London Taxis currently being electric. 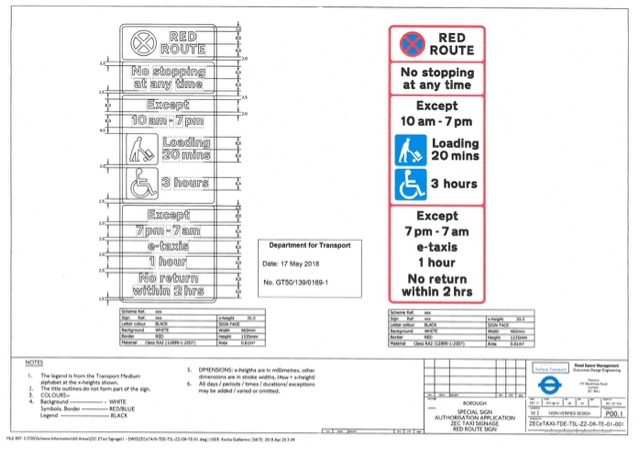 Even though the restrictions apply for a period of hours, they are still preventing access for the remaining 95% of the working Taxi fleet and their passengers, which would result in passengers being dropped off and picked up at least 150 metres from their desired point in many instances. It was expressed that this would result in passengers being unwilling to use London Taxis and also tarnish their reputation for being able to offer a door to door service. Reference was made by LTPR to statements by Prof. Anthony Frew, Professor of Allergy & Respiratory Medicine, Royal Sussex County Hospital a former member of the Committee on the Medical Effects of Air Pollution (COMEAP). He and other eminent Physicians have cast doubt over The Mayor of London’s quotes of epidemiological studies claiming that 9,000 Londoners are dying prematurely every year because of poor air quality, and that estimates of national fatalities have increased from 40,000 to 60,000 per year. These have formed the basis for the data that has prompted the implementation of the ULEV and ULEZ schemes throughout areas of London. Professor Frew states that these statistics don’t refer to real people but is derived from the estimated 340,000 life years lost by everyone in the UK as a result of an average ‘early death’ of around three days due to air pollution, all things being equal, which in reality they are not. Prof. Frew states that just because pollution levels have been made illegal doesn’t mean that they are dangerous. Experts he says, can’t agree on any link between NOx and mortality, and the latest Office for National Statistics data shows that the North-South divide for life expectancy is clearly wealth-related rather than related to air quality. 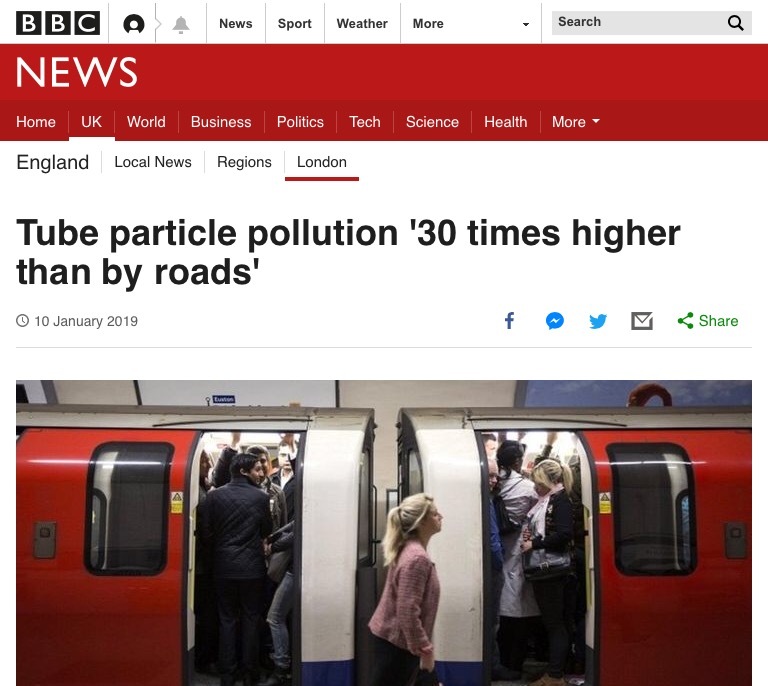 He claims that even by banning ALLtransport in London, would only reduce particulate levels from the current average 14 micrograms per cubic metre to 12, the worldwide background level being 7 micrograms per cubic metre. Therefore, the potential air quality benefits of a ULEZ or CAZ would be insignificant. 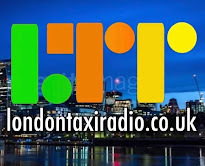 The argument was also put forward by LTPR that not only are these restrictions felt to be a restrictive practice being imposed on the profession, in their role as an integral part of London’s public transport system, but, more importantly, for all Taxi passengers. Equally, it is thought that by allowing only electric vehicles to access these areas that the restrictions are potentially putting passengers with disabilities at a disadvantage, and the aim could have been achieved through less restrictive alternatives. 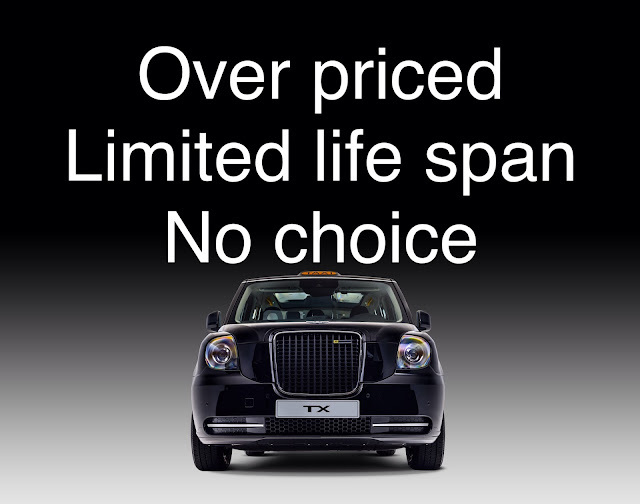 All London Taxis are purpose built, fully wheelchair accessible vehicles, and many passengers with disabilities have come to depend and rely on London Taxis to allow them to be more independent and get around London, quickly & safely, for whatever purpose, be it work, hospital, socialising, shopping etc. They are the vehicles that provide a door to door service for all passengers, something which has become an integral part of their service. The Mayor was informed that the implication of these restrictions have been that the vast majority of the 23,500licensed Taxis in London are now unable to go into the affected roads, as the restrictions only allow access toelectric vehicles. According to confirmed statistics, currently, there are just1,200 Electric taxis in operation across the whole of the UK, which amounts to just 5% of the total licensed operating Taxis. With only approximately 8,000 Taxis working at any one time during a day, if all of those 5% were to be working at the same time, that would still only leave just 400 electric compliant Taxis out of approximately 8,000 that would be allowed within the restriction zones. Thereby restricting 95% of the working Taxi fleet from operating as public transport carrierwithin these areas. 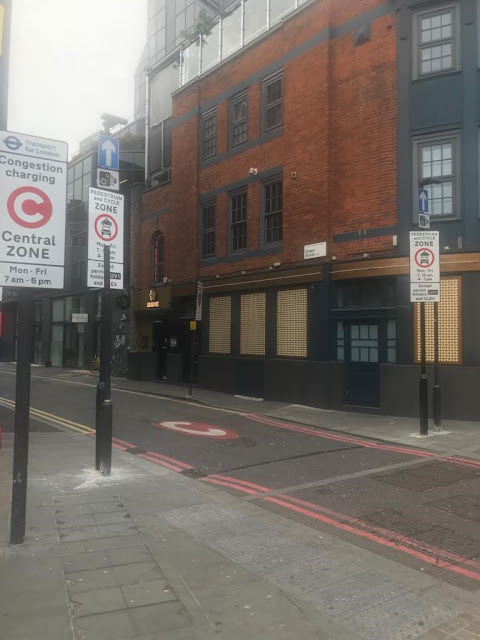 There are currently only 160 rapid charging points available in the whole of London, with just 65 of them being made available to London Taxis. Of these are only 12 sited in Central London, and NONEof the Taxi only points are in Westminster or the City of London. Licensed London Taxis have been a part of London’s landscape for the past 365 years and play an integral part of London’s public transport system. 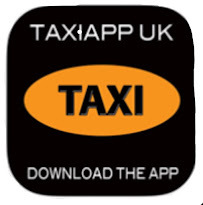 Their door to door service has made them the most envied, highly reputableand recognisable Taxi service in the world. They have a history of being able to know and access roads and streets that are not known to other drivers and have been doing this successfully for all Taxi passengers for the past 365 years. This is why they have gained theirreputation as the world’s no.1 Taxi service and are frequently used by other global brands to promote their business and services. This is what has defined the London Taxi profession. Their Knowledge, professional service, safety record, stringent assessments, access &ability to get around London. 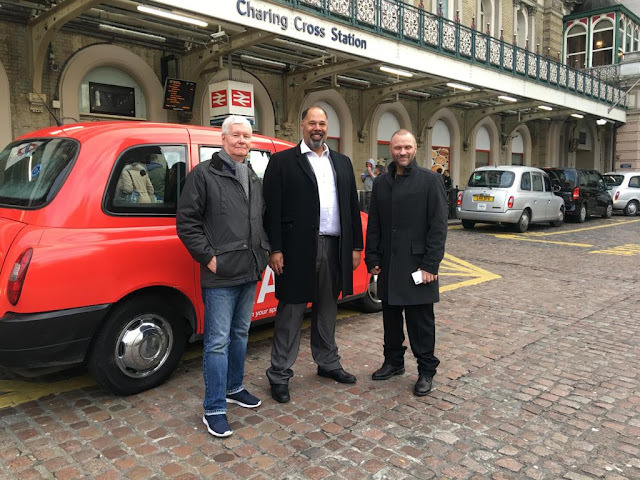 The meeting with the Mayor of Hackney and LTPR was adjourned, and it was emphasised that although no decisions had been made, important views and facts had been put forward on behalf of the London Taxi Profession and its passengers, and that further talks would take place at an agreed date & time, with further dialogue being exchanged in between. 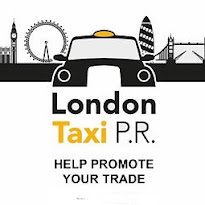 Since their formation, London Taxi PR has undertaken aseries of targeted media campaigns, which are being usedby London Taxi PR to promote the benefits, advantages and safety of using the iconic London Taxi to a wide audience. They Lied To Us Before And They're Lying To Us Again. The Fight Is On....Greenbadgejohn. Being that the TXe is 20 grand overpriced and has a limited time use, its only likely to end in tears for us especially as Tfl has stopped plating diesel cabs to remove all options of new cab purchases to one. When Boris brought in a 15 year time limit back in 2012 he did so to remove what he called old polluting diesels and 7 years on with literally thousands of old polluting cabs removed they have now come after all the rest except that the rest are far cleaner and the last being euro 6 is so clean that TFl are seeking a 12 year age limit on all the rest except the euro 6. The way the Mayoral & TFL schemers are working leave nothing to be believed by us anymore, and it seems only the LTDA have confidence it strategies TFL secretly conspire to deliver, surely the LTDA can see huge errors in policies being dreamt up and delivered upon us? ... apparently not. I, like most, find TFL lacking good relationship qualities when a licensing authority literally provokes its licensees to enter legal proceedings against it and at the same time uses licensees money to defend itself via licensing fees which shows no morality of argument win or lose their end. It is becoming a daily fight to survive unfair competition AND TFLs crushing requirements and this latest 12 year age limit battle can only prove that point. The plan to phase out further diesel licensing was muted in conversation around January 2015 which was not as I believe coincidental to the newly proposed euro 6 which was about to be released by LEVC and would have a sales platform of about 2 years plus, this would keep the manufacturer in business long enough to continue developing the TXe which is the ultimate goal. Simple, so they could bring in a plan for lower age limits a year later without an option to buy another diesel taxi which incidentally eeps its full 15 year status because its so clean!! TFL has finely developed a tool of timed deception and we all fall for it every time, and you can be absolutely certain they have had meetings for the next steps already, so forget the 'consultation' as this word is flawed and actions must be planned by us. So many people in our trade are sleepwalking into thinking a meaningful and honest relationship can be achieved with TFL but I can honestly say after the last 5 years its looking dire unless we stop their ambitions to destroy us we will not survive, and its one of very few times where the truly best service money can buy is going to be completely decimated by the greedy top tabled few powered by the poor needy classes shipped in to do the deed. Think very carefully where you think you will be in 5 years from now, because if you think you are immune from this you are dreaming. We were lied to by Boris who said that he was replacing the dirty old taxis with newer cleaner diesels. Kings Collage bought out a report which proved the older cars he removed were actually cleaner than the new cabs which were given out more NO2, NOx, and PM10. Now we are being lied to by Sadiq Khan who says Taxis are the major polluters, dismissing the fact that his cleaner hybrid buses virtually all are running on pure diesel, a fact he and TfL have swept under the carpet.....And again Kings Collage have come up with a report that the air on the tube is 30 times more polluted than the air at road level. TfL and the Mayor now need a bigger carpet! In Friday's email to members, Steve McNamara claimed that Taxi Leaks post about a possible ban on Taxis using parts of Oxford Street was Fake News. The story was given to us by a member of the joint ranks committee... who attended a meeting with Westminster earlier in the week, and was simply 'a report', not Fake in any form, no mention of a done deal (guilty conscience comes to mind there Steve) and certainly not copy and paste as his online mouthpiece claimed. Let's remind Steve what Fake News actually looks like! 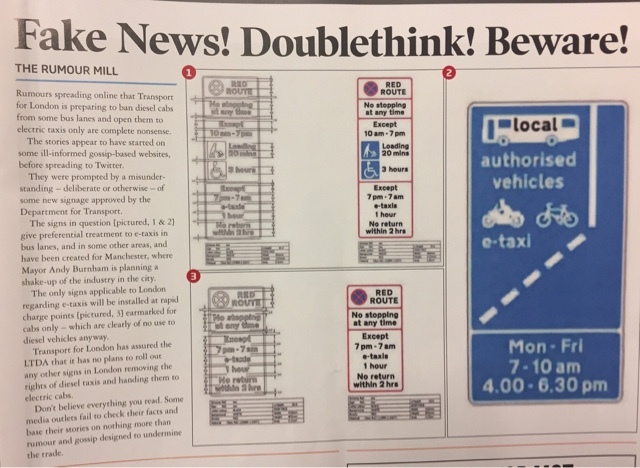 Under the Heading 'FAKE NEWS The Rumour Mill', the LTDA have put out an article claiming that certain ill-informed and gossip-based websites are putting out posts about e-Taxis that are complete nonsense. Exclusive....Another Done Deal For London Taxis, From The Same Mob That Bought You Rear Fitted Credit Card Readers? So far nothing fake or misleading here! They say the so called article appeared first on some ill- informed and gossip-based websites before spreading to Twitter. This is not correct as the information appeared first on Twitter then, after we'd checked it out, appeared later in Taxi Leaks! 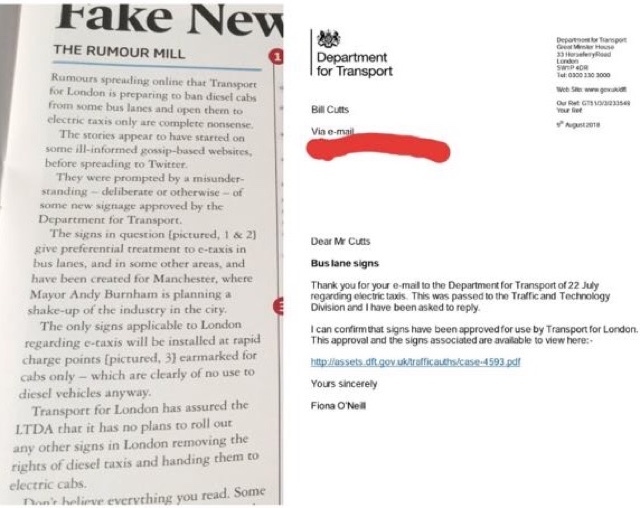 As proof of the so called uninformed fake news gossip, the LTDA offer the explanation that the signage was authorised by the Department of Transport for Manchester City Council. As evidence of the fakeness of the post they posted 3 images of which two they say, show signage that they claim were intended for Manchester Council. Thank you for your email to the Department of Transport of 22 July regarding electric Taxis. This passed to the traffic and technology division and I have been asked to reply. I can confirm that signs have been approved for use by Transport for London. In the images sent to us, you can clearly see the TfL Surface Transport logo in the bottom right hand corner. 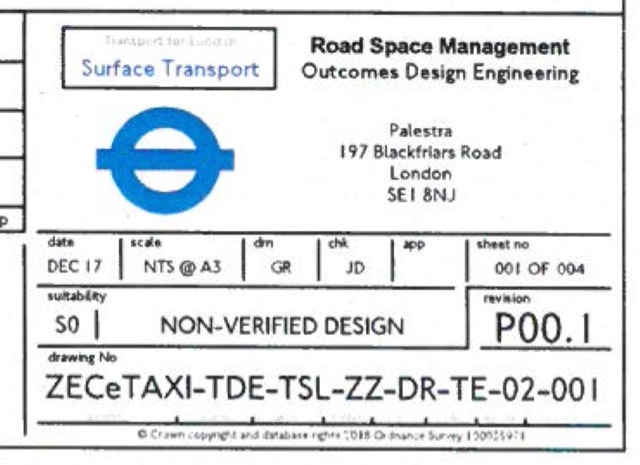 The logos clearly marked out on the DFT PDF, appear to have been omitted from the images which appear in Taxi......wonder why ! No only does it carry the TfL logo, it also has their address on each sign, 197 Blackfriars Road. Now unless we are mistaken, that's definitely not the address of Manchester City Council.....over to you Steve??? No wonder Mr McNamara isn't happy with social media. Good luck explaining this away as "Fake news". Mayor Magically Rediscovers Missing Millions After David Kurten's Tough Questioning. Taxi Trade pundits started taking bets on how long it would take a certain General Secretary that's been totally overshadowed these last few months, to claim the kudos...and it appears, we didn't have to wait long. I met the Mayor along with colleagues from Unite. ‘As a direct result of this meeting’, the Mayor has announced this morning, that he has reinstated the missing funds and that the trade now has access to the original £42 million. Not one word about the wonderful performance from Councillor Kurten at City Hall last week. 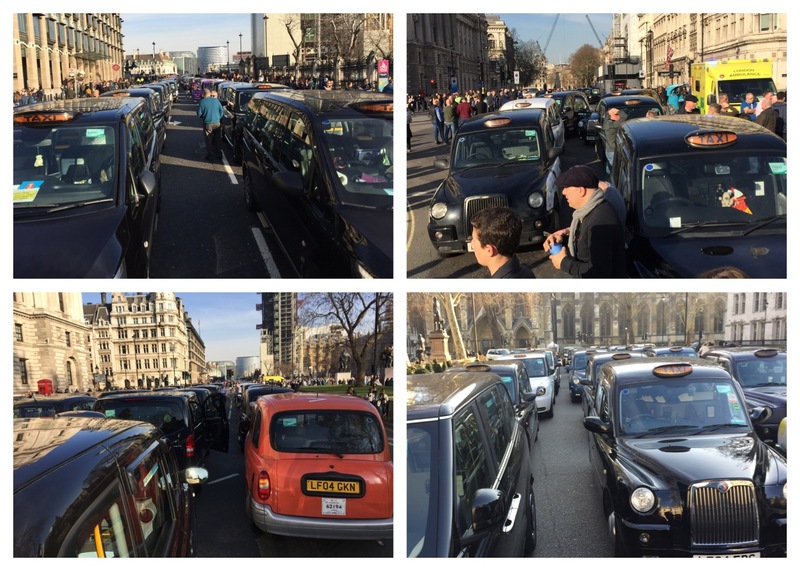 In spite of a mess up by the Met police who failed to advise organisers that school children were protesting about 'Climate Change', Friday's "Where Buses Go, Taxis Go" protest in Parliament Square was heavily attended by rank and file drivers from every org. They were joined by senior officials and committee members from the ITA, UCG, RMT and the LCDC. Again, MPs and members from the House Of Lords came out and spoke with drivers, almost all in support of the action. 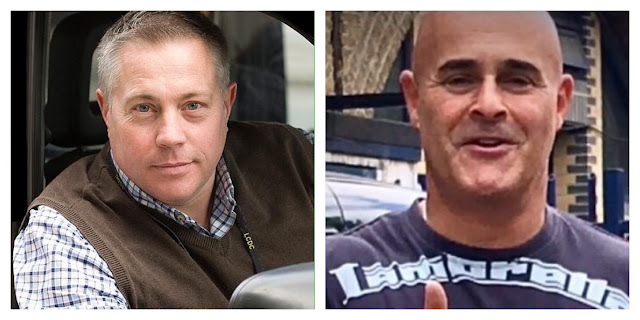 After the protest, the London Cab Drivers Club’s Chairman, Grant Davis accused the LTDA Gen Sec, Steve McNamara of being ‘out of touch’ with the conditions his members face daily. He issued a challenge for him to give up his £90,000 per annum pay check for just one month and try to get by, renting and driving a Taxi for a month. Our trade is at its lowest ebb ever, they are trying to destroy us by stealth and we ain’t having it !!! Do you want to fight like men and women, or go meekly to you’re demise??? This week the trade put its hand in its pocket and went to court. We didn’t go looking for this fight but this is a fight we are going to have. The days of a disunited London Taxi Trade are over. We are sending a message to our opponents, you’ve had a good run on our expense but we’ve turned up to the party...a bit late, but we are here now. The laughing stops and we are deadly serious. The sales of new electric taxis don’t seem to be going to plan as LEVC lay off another 40 workers just two weeks after the news they were laying off 20% (70) of their workforce. 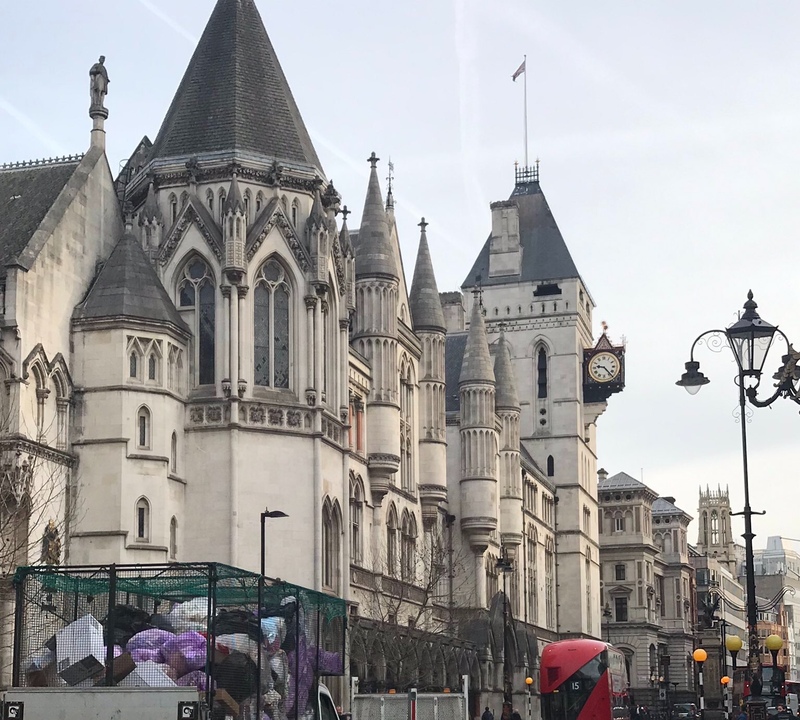 The London Taxi Trade were in court yesterday to challenging Uber’s “temporary” London operating licence at the High Court, claiming the judge who granted it was “biased”. The United Cabbies Group Ltd (UCG), which represents Hackney Carriage Drivers in the capital, says Chief Magistrate Emma Arbuthnot’s decision to grant Uber a 15-month permit was “tainted by actual or apparent bias”. 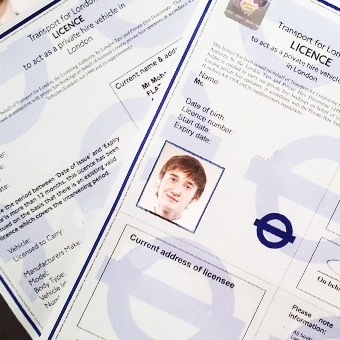 The licence was granted on a “probationary” basis at Westminster Magistrates’ Court in June last year after Transport for London (TfL) refused to renew it amid safety concerns. Judge Emma Arbuthnot said in August she would not hear any further cases involving the taxi-hailing app after a newspaper article alleged there were financial connections between her husband, Lord Arbuthnot, and Uber. Chief Magistrate Emma Arbuthnot granted a 15-month ‘probationary licence’ at Westminster Magistrates’ Court. 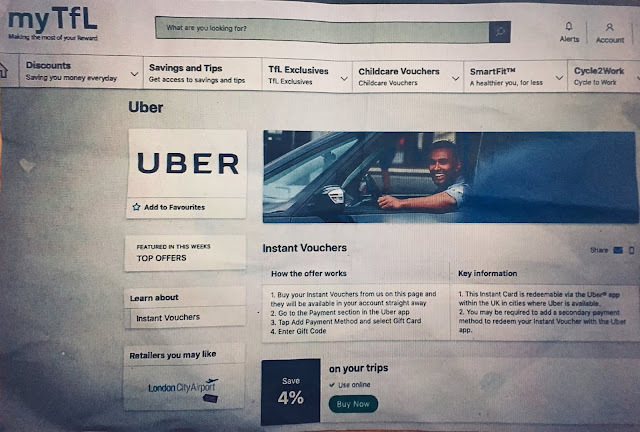 At the hearing in London on Wednesday, lawyers for UCG acknowledged the judge was unaware of any such links but said she should have “checked for any potential conflicts of interest” before making her decision on Uber’s licence. They also argued that the decision was not open to her because Uber did not meet the “fit and proper person” criteria necessary for holding a licence. 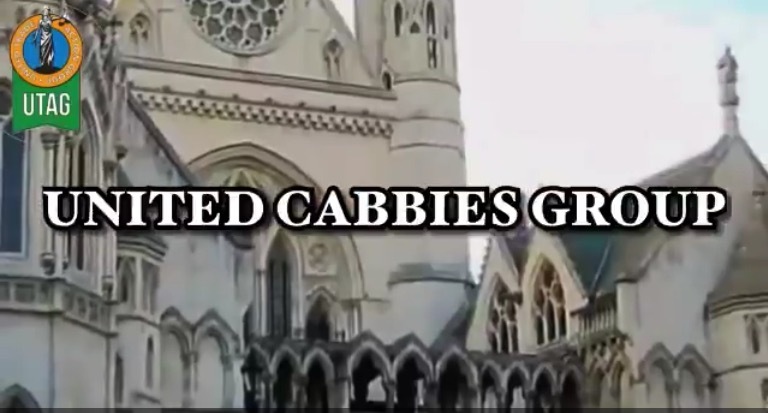 Robert Griffiths QC, for UCG, told Lord Chief Justice Lord Burnett and Mr Justice Supperstone that it was “significant” the judge did not say she was “satisfied” the taxi firm met the criteria. Lawyers for Uber said the alleged connection between Lord Arbuthnot and Uber was “at best extremely tenuous” and the judge was unaware of it. Uber’s application for a five-year licence was rejected by TfL in September 2017. TfL had a number of concerns with the firm, including failure to report criminal allegations to the police and the use of technology to thwart regulators outside the UK. Chief Magistrate Arbuthnot issued the shorter licence with stringent conditions after concluding the firm had made “rapid and very recent” changes. In her ruling she was critical of the firm, saying its failure to inform police of criminal allegations “lacked common sense” and that it had painted a “false picture” of its processes. Following the article in the Observer newspaper in August, she assigned a licensing appeal by Uber which she was due to hear in Brighton to another judge and said she would not sit in future cases involving the firm. In a statement issued at the time, a spokesman for the judiciary said: “Chief Magistrate Arbuthnot did not know the Qatar Investment Authority for which her husband had acted as an adviser was a shareholder in Uber or had any links with Uber. “Lord Arbuthnot was not aware that the Qatar Investment Authority was a shareholder in Uber or that it had any links to Uber. Lord Burnett and Mr Justice Supperstone also heard submissions from TfL, previously made to Chief Magistrate Arbuthnot. The judges will give their ruling in the case, against Westminster Magistrates’ Court, at a later date, probably within 14 days. The trade now has grave concerns that TfL will not fight a retrial as impartially as it should, after Uber CEO dara Khosrowshahi played a master stroke and pledged to TFL's Mike Brown that his 50,000 drivers would all pay the congestion charge, making their continued existence worth about £30m a year to TFL's almost bankrupt coffers. 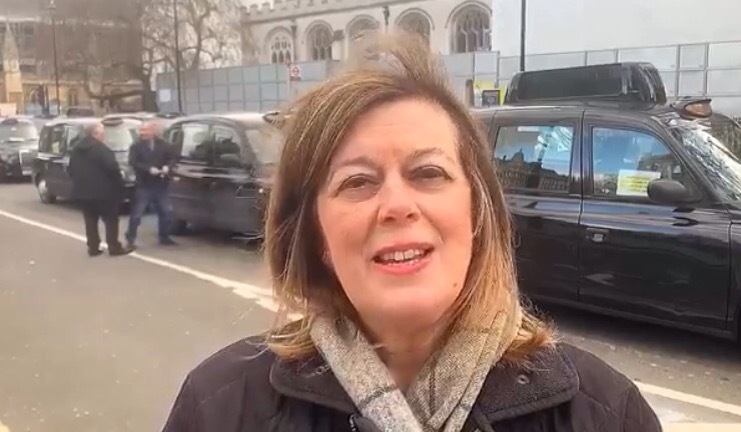 Outside the court in an interview with London Taxi Radio, Angela Clarkson of UCG said "Today we saw TfL in the gallery with their legal team. Next time in court, we want to see them in the dock".